Via: guestofaguest.com: In Kill Your Darlings, Dexter star Michael C. Hall plays the role of murder victim David Kammerer. What’s it like being the victim for a change? "It was a nice change of pace. The karmic scales are starting to be balanced, but I’ll have to be killed 90 more times before it evens out." "I love the poem Kaddish by Allen Ginsberg. I definitely went through my Beat phase, and there was a serendipitous element to being asked to be involved in this." The Ear Inn, the oldest working bar in NYC. shout blind on the phonograph. 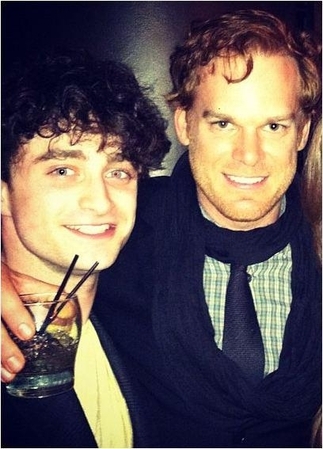 Dexter and Harry Potter in the same movie, so awesome. I'm not a poem fan.... but it is nice....! Hey it will be interesting to see Michael C. Hall as the victim. He is the one who usually kills other people. This time he will be the dead body.